Book a Kingston holiday package on Expedia today! This is one of the best ways of saving time and cash for your upcoming getaway. Reserve your package deal on Expedia and save as much as $200*. You can select from more than 400 partner airlines and 321 000 worldwide properties on our enormous database of lodgings and flights. Fly with who you want, stay where you like — now that's the perfect holiday! Almost all reservations can be cancelled without any additional charges from us. About to take off on your Kingston holiday? Don't know what to add to your travel itinerary? Don't stress — we'll give you a few hints. Get into your khakis and find your lucky driver. If you're to itching to get outdoors for an afternoon on the green, book in a tee time at Kingston Golf Club. Still have some time to spare? Spend some time snowboarding. It's a popular activity you shouldn't miss in the wider region. As there aren't any Kingston properties registered with Expedia, you may find it convenient to stay in Queenstown, which is about 20 miles (32 km) away. The most welcoming options in Queenstown are the Matakauri Lodge, Azur Luxury Lodge, Eichardt's Private Hotel, Commonage Villas, Shotover Penthouse, DH Lakeview Villa, Queenstown Village Apartments, The Spire Hotel Queenstown, Esplanade Queenstown, LakeRidge Queenstown, Hidden Lodge, Platinum Queenstown Villas, The Dairy Private Luxury Hotel, The Rees Hotel and Luxury Apartments, Spinnaker Bay Apartments, The Waterfront, Queenstown Park Boutique Hotel, 22 Hallenstein Apartments, Balmoral Lodge, Villa del Lago, Sofitel Queenstown Hotel & Spa, Queenstown House Boutique Bed & Breakfast & Apartments, The Glebe Apartments, Browns Boutique Hotel, Lakefront Apartments, Element Escapes, Cranbury Court Apartments Queenstown, Swiss-Belsuites Pounamu Queenstown, Hotel St Moritz, Queenstown - MGallery Collection, Highview Apartments, Hilton Queenstown Resort & Spa, Asure Queenstown Gateway Apartments, Peppers Beacon Queenstown, Oaks Club Resort, Oaks Shores, The Lodges Suites & Apartments, Luxury Lake Suites, Crowne Plaza Hotel Queenstown, Central Ridge Boutique Hotel, The Lofts Apartments, Alta Apartments, St James Apartments, Whistler Holiday Apartments, Chalet Queenstown, Amity Lodge Motel, Mantra Marina, Turner Heights Townhouses, Heritage Queenstown, Scenic Suites Queenstown, BreakFree The Point, Alexis Motels & Apartments, Garden Court Suites And Apartments, Autoline Motel, Four Seasons Motel, Caples Court, Coronet View Apartments, The B and B on the Hill, Melbourne Lodge, Novotel Queenstown Lakeside, Blue Peaks Lodge, Coronation Lodge, Millennium Hotel Queenstown, Queenstown Lakeview Holiday Park, Copthorne Hotel & Apartments Queenstown Lakeview, Nugget Point a THC Group Hotel, Lomond Lodge Motel & Apartments, Hurley's of Queenstown, Rydges Lakeland Resort Queenstown, Abba Court Motel & Apartments, Copthorne Hotel and Resort Queenstown Lakefront, DoubleTree by Hilton Queenstown, Heartland Hotel Queenstown, Queenstown Holiday Park & Motels Creeksyde, Amber Lodge Motel, Earnslaw Lodge, Queenstown Motel Apartments, Bella Vista Queenstown, Mercure Queenstown Resort, Lakeside Motel - Queenstown, Holiday Inn Queenstown Frankton Road, Aspen Hotel Queenstown, Queenstown TOP 10 Holiday Park, Shotover Lodge, Reavers Lodge, Swiss-Belresort Coronet Peak, Pinewood Lodge - Hostel, YHA Queenstown Central - Hostel, Nomads Queenstown Backpackers, Base Queenstown - Hostel, Haka Lodge Queenstown - Hostel, YHA Queenstown Lakefront - Hostel, 984 Lakeview, Alpine Village and Pacific Jemm - Luxury Super Yacht. Queenstown International Airport (ZQN) is located 25 miles (40 km) north of central Kingston. Collect your bags, slide into the back of a taxi and let the holiday begin! A great location for water sports, New Zealand’s third-largest lake is an impressive natural landmark framed by soaring mountains and encircled by walking trails. Situated in the mountains, this campground is within 1 mi (2 km) of Kingston Golf Club and Lake Wakatipu. Jacks Point Golf Course and Eyre Creek Station are also within 25 mi (40 km). 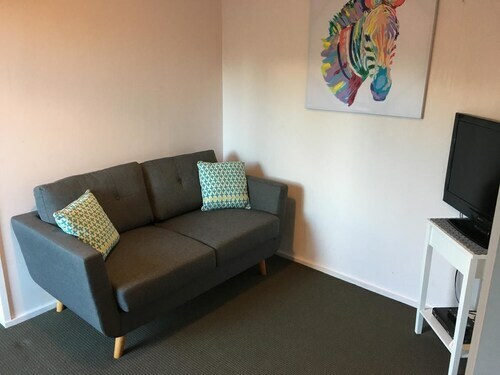 This family-friendly Queenstown hotel is located near the airport, within 1 mi (2 km) of SKYCITY Wharf Casino and Lake Wakatipu. Queenstown Gardens and Skyline Gondola are also within 2 mi (3 km). Situated on a lake, this luxury apartment building is within 3 mi (5 km) of St Josephs Parish, Queenstown Gardens, and Lake Wakatipu. Skyline Gondola is 2.9 mi (4.7 km) away. 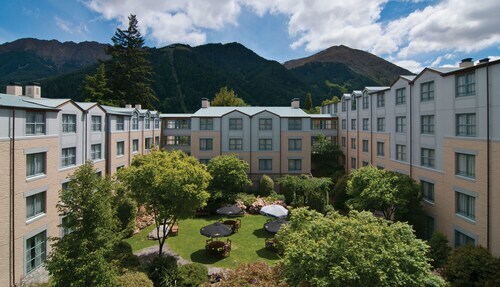 Situated near the airport, this hotel is within 3 mi (5 km) of Queenstown Hill, Queenstown Gardens, and Lake Wakatipu. St Josephs Parish and Queenstown Arts Centre are also within 3 mi (5 km). 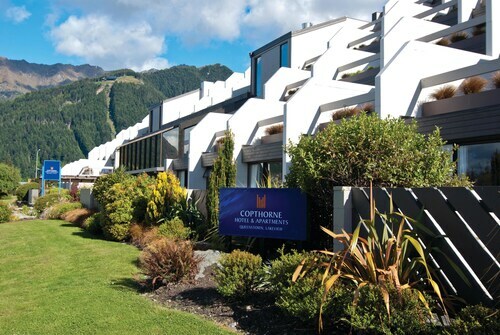 This family-friendly Queenstown hotel is located near the airport, within a 10-minute walk of Lake Wakatipu and Queenstown Gardens. Skyline Gondola is 1.8 mi (2.9 km) away. 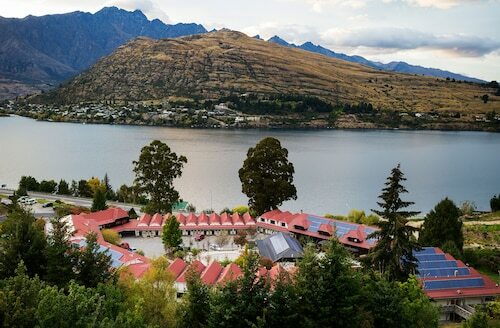 Hilton Queenstown Resort & Spa is on the eastern shore of Lake Wakatipu in Kawarau Village, 5 minutes’ drive from Queenstown Airport and 15 from the center of Queenstown. A local water taxi (surcharge) takes guests to sights like the Skyline Gondola, as well as to all kinds of adventure sports. This family-friendly Queenstown hotel is located on a lake, within a 5-minute walk of Williams Cottage and Lake Wakatipu. Queenstown Gardens and Skyline Gondola are also within 2 mi (3 km). Located in the heart of Queenstown, this hotel is within a 15-minute walk of Lake Wakatipu and Queenstown Gardens. Skyline Gondola is 2 mi (3.3 km) away. Wed., 10 Jul. - Fri., 19 Jul. Mon., 5 Aug. - Fri., 9 Aug.
Wed., 26 Jun. - Tue., 2 Jul. Thu., 28 Nov. - Sat., 7 Dec. Mon., 3 Jun. - Sun., 30 Jun. Looking for Flights, Hotels, Car Hire and Holiday Rentals in Kingston?